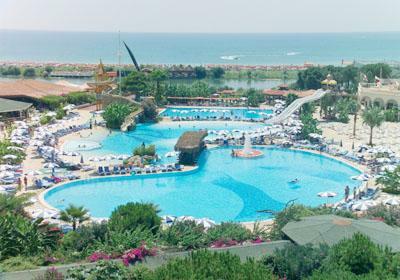 The Letoonia Golf Resort is situated right on the beach in Belek, Belek village is just 5 km away, Antalya is 35 km away, airport 43 km away. There are 4 golf courses near the hotel, two nearest are 4 km away. 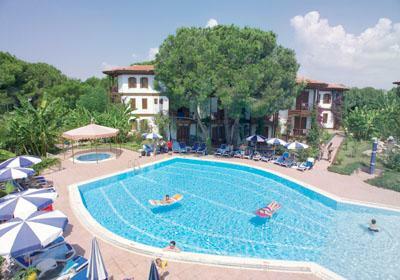 Letoonia consists of the main hotel building and many holiday village bungalows. 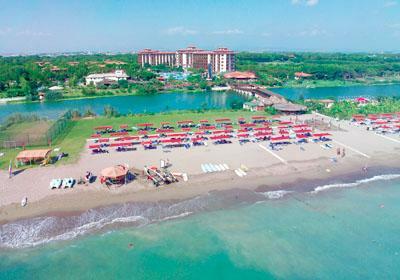 Situated of Belek beach with plenty of facilities and its typical Turkish characteristics, this place is popular with couples and families alike. The atmosphere here is relaxing and friendly. Reception * 5 restaurants * 7 bars *conference halls * 2 outdoor swimming pool with a children's section and slide * indoor swimming pool. 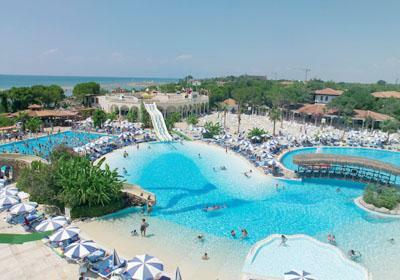 Sport and lesuire (free of charge): Entertainment programmes * tennis courts * table tennis * billiards * darts * golf lessons for beginners * mini-golf * sauna * Turkish bath * Jacuzzi * fitness * non-motorized water sports (pedals, canoe, surf, catamaran) * disco. Mini-club (4-12 years) * fresh juice and non-alcoholic cocktails in the Vitamin bar * Teenage-club (12-16 years) * children's swimming pool * slide. Telephone * motorized water sports * tennis court's lightning * laundry * massage * doctor * hairdresser * peeling in Turkish bath. Hotel rooms : Bathroom (WC + bathtub + hairdryer) * central air-conditioning * satellite TV * minibar * telephone * private balcony or terrace * safety box (free) * carpet. Holiday village: same equipment (instead of bathtube there is a shower). Hotel is situated right on the beautiful sandy beach with pebbles at the shore. Sunbeds, umbrellas and mattress free of charge. Unlimited soft and alcoholic local drinks and selected imported drinks (from one of the bars open 24 hours a day). Room service from 0.00 till 07.00 o'clock (menu). Open buffet breakfast, lunch & dinner, dinner with possibility of dining in a la carte restaurants – reservation required. Unlimited soft and local alcoholic drinks during the lunch and dinner. Late breakfast, various snacks during the day (11.00 – 17.00 o'clock), 5 o'clock coffee & cake (17.00 – 18.00), midnight snack (24.00 – 01.00 o'clock ). Fresh fruit juices and non-alcoholic fruit coctails in the vitamin bar.